The mainstream media's lack of critical thinking when covering the topic, has helped the growth of White supremacism, writes Tom Tanuki. I HAVE BEEN MISTAKEN by the Australian mainstream media for a white supremacist extremist on three occasions. Not by accident. It’s not that I have a particularly neo-Nazi aura about me, even if I am very white. I planned the first two occasions back in 2017 and when they happened I viewed them as successes. They pointed to the ineptitude of the mainstream media in covering white supremacy in Australia and, also, they were funny. The third time, however, was on the ABC’s Four Corners last Tuesday night. It was years after Million Flag Patriots (more on that later), certainly not planned by me and a little over a week after Christchurch. I’m not sure we’re laughing anymore. The Australian patriot movement received mainstream attention in 2015, stirred up here by the globally-transmitted foment of U.S. and UK anti-Islam online agitation (and funding — some say that one of Australia’s largest patriot groups received an international start-up cash injection of over $100,000 from U.S. white supremacists to start organising hate rallies and grabbing headlines). Leaders of the patriot movement organised initially large-scale – then slowly dwindling – rallies to push their message out. They created a network for the radicalisation of people like the Christchurch killer and Phil Galea, who was arrested in 2016 with bomb-making materials he planned to use to kill Left-wing activists. They gave the world a band of poster-boys like Blair Cottrell, nationalist video-makers and organisers addicted to the attention of television cameras. The far-Right might live on, but the organised patriot movement largely died in mid-2017 when its Facebook pages were removed. Although the mainstream media was focused mainly on cobbling an easy “both sides are as bad as each other” narrative together using rally footage, a broad coalition of anti-racist, Left-wing and other community collectives provided staunch opposition to the patriot movement from the day it began. They did it by organising, information-sharing and organising counter-protests among many other tactics. They refused to let white supremacists assemble freely in public. For this alone, Australia owes a far greater debt to these groups than it seems to realise. During the height of this, I began my less-than-conventional response to Australian nationalism in June 2016 — I made a fake patriot group. I called it the Million Flag Patriots (MFP). I played the National President of the MFP – the Five Flag General – and started making non-stop attention-seeking videos, just like the real groups. The MFP’s aim was to provoke the organised racist movement into anger and response, again and again. MFP grew bolder with every passing month. I made Australia a new flag, manifestly more patriotic than the original – the Triple Flag, adorned with three times as many stars, bits of red and other stuff. The Triple Flag became a kind of sigil representing anti-racist comedy, a ridiculous symbol that accumulated more meaning, significance and power over time. In September 2016, the Five Flag General hung 20 “old” Australian flags up on a Hills Hoist and burnt them all (he simply wanted to eliminate them to make way for the more patriotic Triple Flag, you see). After this and the rest of the provocations directed squarely at patriot groups by MFP, the death threats began to pour in. I received tens of thousands of them over the first six months of MFP, the tears of enraged racists flowing like cheap cask wine. Leaders of the patriot movement uncovered my personal details and directed ex-ADF personnel to pay me a visit at my home, to an audience of hundreds of thousands. People threatened to blow me up (and once the aforementioned Phil Galea was arrested, I wondered if that might have been more than talk). My view was that the more these garbage people were focused on MFP, the less they were focused on Muslims, Indigenous Australians, queer people and other favourite targets of theirs. The more their rage was directed at an imaginary character like the Five Flag General, the more it would gain them nothing but mockery and ridicule. The MFP grew into something of a genuine direct-action, anti-racist comedy group, organising alongside more substantial groups like the Campaign Against Racism and Fascism. In March 2017, when three named patriots including Blair Cottrell faced court charged with inciting hatred against Muslims, we of the MFP showed up outside the court to “represent” Aussie patriotism before the media. The mainstream media took the bait more enthusiastically than expected. Every television station broadcast footage around Australia of the MFP troop proudly displaying our Triple Flags as though they were the real deal and thus, we became the real deal. There was Channel 7 footage categorising us as United Patriots Front (UPF) supporters, even though the audio playing was of me yelling that Blair Cottrell is a “puffy sociopath who lives with his mother”. It was surreal. Accordingly, MFP’s efforts were covered by ABC’s Media Watch, who seemed as stunned as I was that the media had so willingly fallen for this trap. “Python-esque”, they called MFP’s brand of comedy. Not sure anyone wanted to blow up Monty Python. That was the first time I was mistaken by the Australian mainstream media for a white supremacist extremist. The second time was at the second court appearance of Blair Cottrell and two others for the abovementioned charge, in May 2017. This time, Blair had just had his big UPF Facebook page deleted. 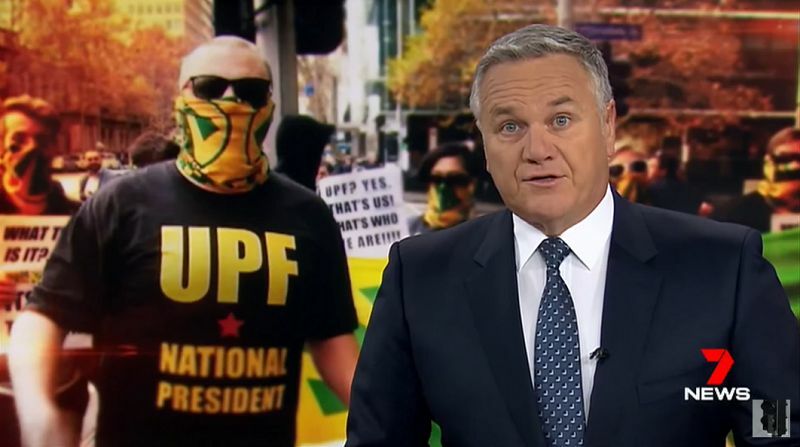 I was keen on shifting MFP’s physical presentation just a little to see if we could dupe the media to present us, for a second time in a row, as genuine UPF supporters. I went along in a shirt that helpfully said ‘UPF NATIONAL PRESIDENT’. Another MFP member came with a placard that read ‘UPF? YES, THAT’S US! THAT’S WHO WE ARE!!!’. Very convincing. This image – of me in my stupid obvious shirt with that stupid obvious placard next to me – was the title card for Channel 7’s coverage of the event. The point of MFP was to subject the patriot movement to endless mockery but of a confrontational, direct-action kind. Our media trickery was the culmination of these efforts because it made the patriot movement look even more stupid in the eyes of Australians who’d had enough of masked racists, but it also managed to point to gaping holes in Australian mainstream media coverage of organised racism. The media simply couldn’t tell what was real and what wasn’t. All they wanted was the melodrama of a clash between opposing groups, the cartoon surrealism of a group that looked like MFP. They were willing to promote – or, at least, not stand in the way of – organised racism in exchange for sensational footage. I believe MFP exposed that ridiculousness and made the genuine patriot movement a much less comfortable space to occupy for its members. The patriot movement had been starved of its oxygen by losing its big Facebook pages and I believed there was little point in continuing to undermine something that was dissolving and changing shape. I ended MFP in July 2017. Now I discuss matters of anti-fascism as myself, having long ago removed the Triple Flag facemask. Recently, we who engage in and try to understand organised white supremacy have seen a marked shift in the popular understanding of these movements, under the darkest of circumstances — the Christchurch massacre, when a UPF fan fired at and killed 51 Muslims in two mosques. Out of the shadows of this tragedy and outrage, many people are finally more willing to understand the danger that these extremists pose; the extremists fed by our media to the nation in the form of entertaining, sensationalist footage since 2015. Some of our media continue to get it all laughably wrong. I’ve seen a push from parts of the press to suggest that this white supremacist mass murder shouldn’t deter us from “legitimately” questioning Islam, as though the answer to murderous Islamophobia is ploughing ahead with a bit more Islamophobia. We’ve seen inferences that violent video games were to blame, an idea that I thought was left behind with ’90s-era censorship efforts and the Columbine massacre. Did you know that we’ve since learned that the Columbine killers were heavily influenced by Nazi ideology? Not the video games then, perhaps? There’s also, most dangerously of all I think, the growing assertion that the Christchurch killer was a “lone wolf”, despite his years of association with the Australian patriot movement, his documented support for Blair Cottrell and a 74-page manifesto that clearly details the connections between him and the white supremacist ideology touted by people like Cottrell. Greg Sheridan of The Australian wrote that ‘white racist terrorism… can never occupy territory’ — news that I trust will come of considerable surprise to Indigenous Australians or any of the victims of brutal colonialist expansion. Andrew Bolt, paid sounding board for Australian far-Right extremist ideas, asked, ‘The Christchurch massacre: do the Greens have blood on their hands?’ Sure, it’s absolutely the fault of a progressive minor political party that an Australian white supremacist murdered 51 Muslims, Andrew. The ABC had a strong run of bad broadcasting decisions on the night of Tuesday 26 March. First, Liberal Party Federal Vice-President Teena McQueen backed up Andrew Bolt’s views in a train wreck panel appearance on Q&A, insisting that white supremacy here is “not growing” and describing Di Natale as a purveyor of “hate speech” because he hasn’t been nice to Bolt. Then, during their Four Corners special on Christchurch, ‘Under the Radar’, they displayed some footage of far-Right extremists while discussing the nationalist movement in Australia. Except it wasn’t far-Right extremists they were airing. It was me, during my May 2017 faux-UPF courthouse appearance. In fact, the ABC used footage of me, during an appearance intended to undermine the patriot movement, overlaid by a voiceover uttering the words “Brenton Tarrant”. To the casual observer, it kind of makes it look like I’m Brenton Tarrant. Glad I had that face mask on. Thank you, ABC. So that’s the third time I have been mistaken by the Australian mainstream media for a white supremacist extremist. I am not laughing anymore. I no longer think it harmless that elements of our media, just after a mass murder, cannot tell the difference between real and fake. After Christchurch, we as a nation of institutions ought to be in a moment of serious self-reflection and critical thinking. How did Australia get here? How have we collectively missed the violent extremism of these groups? How did we promote them, facilitate their rise, or stand by while people like the Christchurch killer became more radicalised? These are questions that our people, Government, police and our media must be asking. Some of our media appear to need encouragement in these reflections on personal responsibility. So, allow me to assist. The Christchurch killer was an adherent to the same ideology as Blair Cottrell, Senator Fraser Anning and other successors to, or relics of, the Australian patriot movement. It is merely his tactics that were different. The 2015 rise of that movement and its promotion by the Australian mainstream media was the killer’s entryway onto a highway toward extremism. He is not a lone wolf. There are others in Australia plotting the same thing as him on secure, closed-network fascist platforms. There are white supremacist groups in Australia planning to build white-only enclaves and towns. Some have recently vaguely threatened that if they aren’t allowed to do this kind of thing peacefully, their members might go down the same path as the Christchurch killer. This is all true. Our media are responsible for the ubiquity of organised racist messaging in Australia through their ongoing broadcasting of nationalist stunts and rallies. They continually aided their rise to prominence. Right back from their 2015 promotion of Reclaim Australia as being a movement of “concerned mums and dads”, through to the media walking hand-in-hand with Blair Cottrell in January 2019 to promote an attempted race riot at St Kilda Beach, they have consistently validated organised racism. They are responsible for the difficulties that community and activist groups have faced in responding to this violent nationalist threat, through promoting the reductive “both sides are as bad as each other” narrative. The Australian media is responsible for mainstreaming the patriot movement. They have wasted the nation’s time prioritising the voices of people who know nothing of the subjects they task themselves with rubbishing, like Kerri-Anne Kennerley slagging off Indigenous Australians, or a series of convicted criminals like Cottrell being given the space to help influence the national agenda on racist attitudes towards Muslims and Africans. They have done so while sidelining the voices of Muslim, Indigenous, African and other anti-fascist voices who have been warning of the dangers of platforming this movement since its inception, if not outright predicting an atrocity the likes of which occurred in Christchurch. It is not the Muslims’ fault that 51 of their number were killed. It is not the Greens’ fault that it happened. It is the fault of the individual, the movement that took him in and radicalised him, the ideology that informed him and the institutions that supported that ideology — such as the Australian media. In 2017, I stepped into the light of national mainstream media attention simply by putting on a ridiculous pantomime of real patriot groups. I succeeded in it with ease, because our mainstream media apply no critical thinking when broadcasting organised white supremacists. It was a fun failure to point out through MFP in 2017. Now, in 2019, after Christchurch, it is no longer entertaining or illuminating. I wanted no part of it. MFP’s done now. I demand ethical restrictions, critical thinking and higher standards from our media in the way they report on organised racism from now on. It may save lives.